AKC Grand Champion Rinchen's Magical Illusion "Ali Baba"
Glad to be at the AKC Parent Clubs invitational opening of the AKC Museum of the Dog on Park Ave., with Tibetan Terrier Club of America Breed Ambassadors, Sheryl Getman (with husband Dan) and Karen Tromblee. ​at her debut show weekend ! 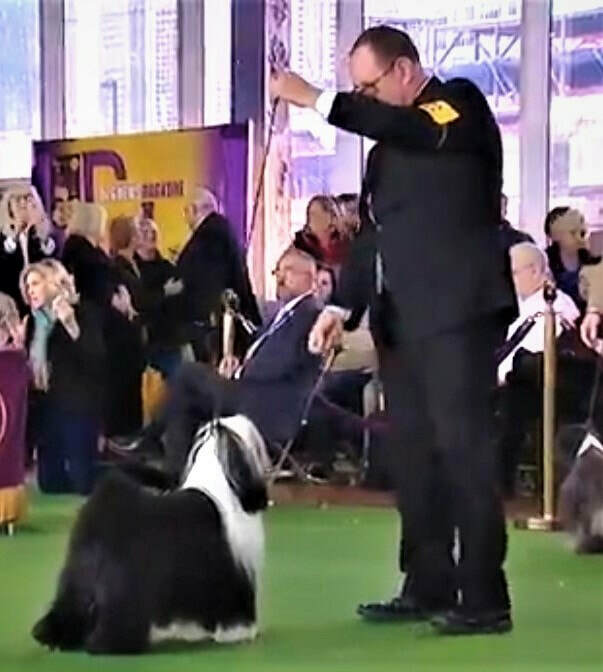 "Winnie", Bier's When Comes The Heart v Rinchen, OWNERS: Joann Biercuk & Claire Coppola, AGENT: Courtney Norris, 5 point major win under JUDGE: Douglas A Johnson. Also Best Puppy, March 22nd & 23rd! Early April... not much 'springtime' yet! Rinchen's All Eyez On The Dancing Queen "Vasilissa" with a stick. Teething time @ 5 mos! Happy first birthday April 2018 puppies! Peri guides tourists with his owner Mitsuko in the American South-west. Sisters reunite at 5 months! Nothing short of a good hug will do! Rinchen pups at their first training match... Mochi & Emily, Trouper & Claire, Marvel & Lauren from All-Breed Rescue & Training with Zack (on the left), & Bob & Wylie (right).